If I had a dollar for every gadget I’ve bought, I could buy more gadgets! As geeks, we have a special place in our hearts for elegant, useful, or just plain cool gadgets. In fact, we love our gadgets so much this year that we will have to split this guide into two parts. Read on for the first dozen gadgets that we have grown to love and treasure this year. For a professional level of sophistication, give your audiophile the V-MODA Crossfade M-100 headphones. 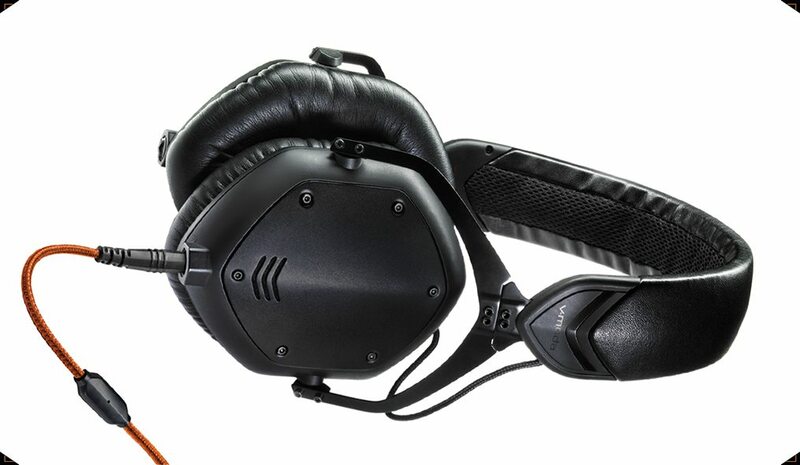 The M-100 features high-quality audio output in a nigh-indestructible frame. The steel construction is flexible and bounces back when other headsets would die. The cables are exchangeable, including two different microphones and other features. Those cables are also wrapped in Kevlar, and it takes a lot to kill one. For a truly unique experience, V-MODA also offers custom plates for the earpieces. The Riva Turbo X Bluetooth speaker ranked among the best I’ve tested this year. With three dual-range custom ADX drivers, four custom dual piston bass radiators, and a 45 Watt amp, it puts out a lot of sound for a portable speaker. Want it louder? Turbo Mode pumps the volume to 100 decibels, while Trillium Surround is great for videos or gaming. It’s one of the few speakers I’ve seen with a Phono Mode for use with a turntable. In addition to premium sound, the Turbo X’s battery is rated for 26+ hours, plus you can use it to charge a mobile device. Quickly and easily print pictures from your mobile device. The printer is about the same size as your phone (assuming you don’t use a phablet, in which case it’s way smaller), connects via Bluetooth or NFC, and prints 2×3 pictures on special paper. My teenager absolutely loves it. Read our full review. I’ve been driving with the Cobra SPX-7800BT on my dash for two months now and love it. My previous radar detector was an older model Cobra and it served me well, but the extra features of the 7800BT make it worth the upgrade. The 7800BT works very well as a stand alone radar detector, but really shines with the Bluetooth connectivity and a free app for your phone. The app combines your location and signals from the radar detector to alert you of upcoming speed traps and dangerous intersections. I can’t say for sure if it has saved me from an accident, but it is nice to know when an intersection deserves a little extra caution. Winter is certainly upon us. And since it’s an El Niño year, we’re probably in for a long, cold one, which is why the Dyson AM09 Hot + Cool Fan is a great gift idea for your family. Using brushless motors and taking advantage of the Coand? effect, Dyson is able to project a powerful, heated flow of air that will make a whole room comfortable. Or, using the included remote (which can dock magnetically to the top of the fan), change the flow so it is directed just toward you, adjust the temperature, set the sleep timer, and take a well-deserved nap. In its initial mode, the fan is whisper quiet. What’s more, the fan can oscillate and tilt and you can also affect the fan’s airspeed. But the fan isn’t obsolete when summer arrives again. The Dyson AM09 Hot + Cool Fan can deliver chilly 32º air to make you comfortable–quickly. It has a number of safety features and over 500 patents, because Dyson products are amazingly engineered. Microsoft is proving that they are solid players in the hardware game by not only improving on the excellent Surface Pro 3 in their new Surface Pro 4 model, but they’ve also come out with a more laptop-y Surface Book, which also acts as tablet. Both models have the Surface Pen, which is the best stylus that GeekMom Jenny has ever used. If you’re looking for one device for all of your needs (except, possibly, intense computer gaming), one of these Surface models will be right for you. The MAX One unit is pack full of smart technology and works by just plugging it in. The handy all-in-one unit is a night light that also becomes a flashlight, with battery backup, when the power goes out. It also detects signals from smoke and CO2 alarms and acts as an enhanced audible and visual alert for both. Also, it has a security mode that detects motion, making it great for intruder detection. Great gift for the smart home and the traveller! I’ve written about Tile a couple of times already this year and it remains one of my favorite gadgets. It’s funny how saving you a couple of hundred on a lost key remote will endear a device to you. Tile is a key/phone/anything finder that acts as a beacon for whatever you attach it to. If you’ve lost it, you can use the app to activate your Tile and it will chime and update its relative location until it’s found (the opposite is true too, the Gen 2 helps you find your phone). If the Tile is way out of range, you can set it as Lost and you’ll have the power of the entire Tile community hunting it down (anonymously). Tile’s aesthetics are simple and clean. The hardware is easy to use. The app is regularly updated and has great community support. Even better, Tile is offering a gift bags and tags with every 8 or 12-pack purchased through their store, perfect for stuffing stockings or handing out as holiday gifts to your kid’s teachers or at the office (the multi-pack discount averages out to $15 a Tile). So instead of another Starbucks gift card, give them something they’ll actually use this season! This compact propane grill will transform the way you think of homemade pizzas. It cooks them evenly and, best of all, quickly–an 8-inch pie will be done in only 3-4 minutes, meaning that everyone in the family can make their own, ending those battles over which toppings to get. And since it’s outside, you don’t have to heat up the house to cook dinner. Check out our full review. The Harmony Elite is the next step in the long line of excellent universal remotes from Harmony. The Elite is a combination touch-screen and pushbutton remote that, when tied with the Harmony Hub and their excellent web tools, makes it amazingly simple to pull together control of all your various entertainment appliances onto one device, and set up one-click actions to turn on and adjust the settings of everything you need to do everything you want–watch TV, play videogames, use an AppleTV, manage many home automation appliances, and more. It even ties into iOS and Android apps allowing control from your mobile devices as well. ← Ditch the Trees. Get a Wipebook.